Rumblings in the art world in the late 1880s championed the concept of an art that had the potential to be all-encompassing. Professing that quality and design could be found in every aspect of life, in every room of the house, and at every socio-economic level, art movements such as Arts and Crafts were launched in Britain, Europe and the United States. Vienna 1900 Complete documents a similar version of this train of thought in Vienna, Austria at the turn of the century. Between 1890 and 1918, Vienna was a true melting pot of nationalities and in the midst of a population boom. People gravitated there from 16 different countries including Hungary, Bosnia, Galicia, and Bohemia. Languages, cultures, and most importantly, ideas, fused. Not surprisingly, the same timeframe witnessed an explosion of newspaper and magazine publications with over 200 newspapers available in Vienna. Which explains why the likes of Sigmund Freud (himself an immigrant from Moravia) and Gustav Mahler spent hours in various coffee shops reading and debating. 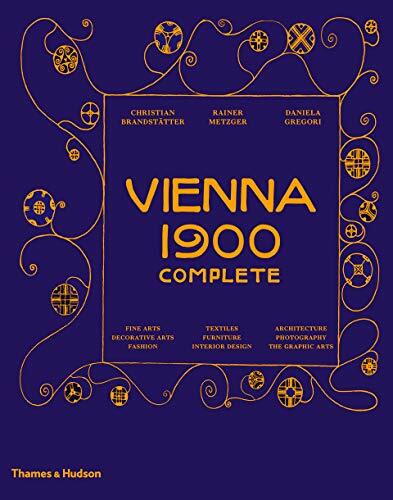 Like most art-isms, movements or fads, Vienna 1900 was short lived, coming to an end in early 1919 when several of the key promoters died, World War I made its impact and Austria’s monarchy collapsed, sending Vienna into a tailspin resulting in the scattering of the remaining intelligentsia. But with that scattering, the foundation of Vienna 1900s ideas were disseminated further abroad reaching north to Sweden, south to New Zealand, east to Japan. Spanning a gamut of design from painting and drawing, to applied and decorative arts, to architecture, Vienna 1900 leaves nothing out. The rich variety of items produced in this time frame necessitates a large volume. At nearly eight pounds, with high quality glossy paper, over 1,250 images with many full-page reproductions, and dozens of biographies, this project is a veritable encyclopedia. In this section are black and white photos circa 1900 that serve as an historical gallery, evidence of the types of rooms in which these art objects were originally on display. Many of these objects are then featured in color images so the reader is treated to both the artwork and its context. Lamps, centerpieces, side tables, chairs, tableware, vases, jewelry, and figurines in glass, metal, or wood; carpet designs, textiles and ladies’ fashions; book designs and other graphic design items such as bookplates, business cards, post cards, and posters—are all packed into this one smorgasbord segment accompanied by text about the designers or craftsman. Wrapping up the volume is a substantial and extensive quick-reference alphabetical literary and visual index of artists, companies, and institutions that participated in the movement, making Vienna 1900 Complete a formidable, comprehensive, well-rounded collection of design and artwork from a pivotal point in modern history.